For a New Year's dinner with my parents my & I decided to cook one of the pieces of beef we got for Christmas. Matt thought it would be good braised in a classic mixture red wine & herbs. He was so right as the meat came out juicy, tender & oh so tasty. The wine, herbs & juices create a wonderful au jus to serve with the meat & some mashed potatoes. Plus it was no fuss giving us plenty of time to take my parents' money in cards! 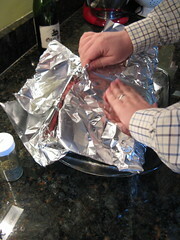 Lay out 2-3 layers of tin foil big enough to wrap the beef in. Salt & pepper the beef & lay in the middle of the foil folding up the sides to create a bowl. Sprinkle in the garlic, onion, thyme and marjoram. 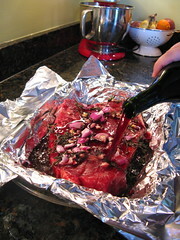 Pour in enough wine to cover the beef about halfway. Bake for about 3 1/2 hours. Carefully remove meat from the foil packet. Move to a cutting board or serving platter & tent to keep warm. Strain the cooking juices into a skillet. Bring to a simmer. Whisk in the butter & let simmer for about 5 minutes. Test for seasoning. Serve with the beef. beef cooked in red wine is the best isn't it? This is my absolute favorite way to have chuck roast - the only change I make is I use a dutch oven rather than the tin foil thing. My leftovers are usually chopped up and put in chili - I like the 2 textures of beef - hamburger and the chunks of roast - delish! It's awesome to start off the new year with some delicious leftovers, isn't it? Beef looks amazing -- and those leftovers are screaming out to be made into a panini, if you ask me! I love beef and red wine together. I drooled over several recipes I will have to try. Oh, speaking of your comment of loving the salty sweet-have you ever tried the chocolate covered bacon Pig Lickers at the fair? Would this work in a crock pot? I would think low for about six hours? Anonymous - I do think this would work in a crock pot. The main thing would be having a crock pot big enough for the cut of meat. Thank you, Kat! 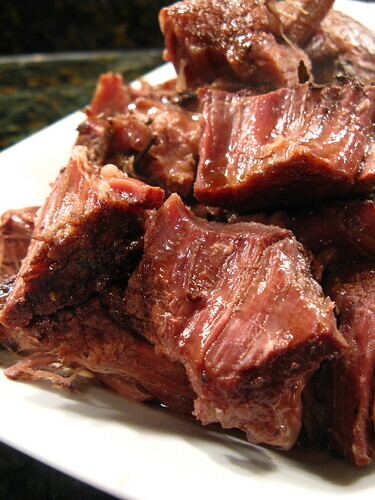 I have a large oval crock pot, so I will try it this weekend and post the results. Hello! I love this type of recipe. I used to cook a similar dish using nothing more the a dry onion soup mix as the spice. This looks even better! I'd like to say in a non-critical way, that your phrase "The wine, herbs & juices create a wonderful au jus to serve" while used by a lot of Americans, would be more technically correct if you replaced the words au jus with just jus. Au jus means with juice while jus means just juice. Thanks for the recipe!! Looks fabulous. Can't wait to try it. 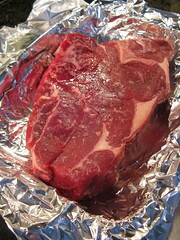 On a foodie email list I belong to, some of us were saying not that long ago that we'd never heard of a chuck roast. (We typically use it diced in casseroles etc.) I'll have to point them to this! This is THE only way to cook a beef roast. It never fails me ever, and makes the most sumptuous meat. Plus it smells incredible! Wow! I love the simplicity of the recipe and the easy clean up! Great job guys! The result looks awesome...juicy, tender and flaky meat. Perfect. This is certainly one of the delightful easy healthy recipes that I’ve ever tried!! We made it with my mom for our gatherings and it taste really good!